I have another fun Mother's Day/teacher gift for you today that's SO simple and endlessly customizable! If you read my previous project for The Little Things Purse, I'm not into big, bulky purses. In fact, I carried my wallet, phone, and other essentials around with me in my pockets until just a few years ago - it wasn't pretty. I broke down and gave into the fact that purses are not only essential for carrying valuables, they're really pretty too! 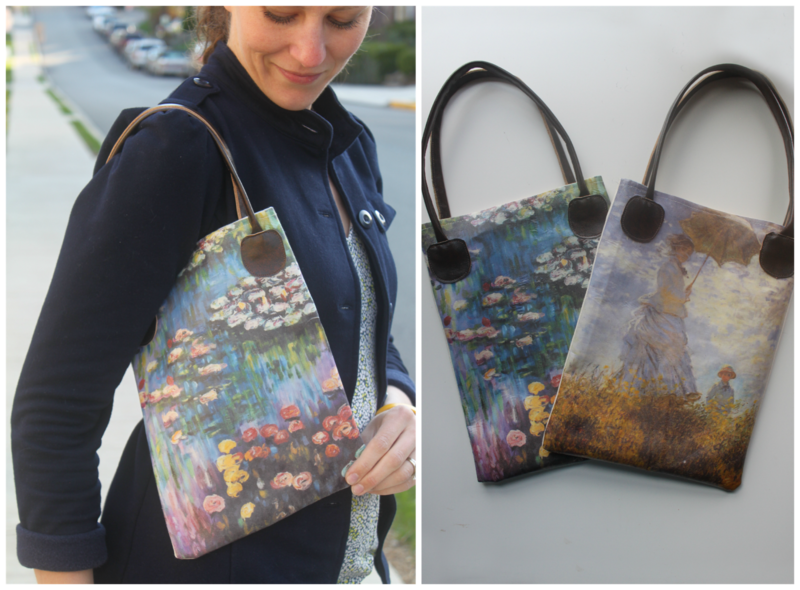 Grab some supplies and make some for your mom, grandmother, mother-in-law or treat yourself to a new bag! SUPPLIES: fabric transfer paper (I used Transfer Magic, which I found in Hobby Lobby I think? ), two 9x11.5in pieces of canvas fabric or other heavy fabric, two 17x1in strips of 5-7oz leather + scraps, printer, sewing machine and heavy duty needle, pinking shears. ONE: first, cut out your pieces. You'll need to cut out 2 straps for your leather measuring 1 inch wide by 17 inches long. Also cut out 4 small pieces of leather big enough to cover the raw edges of your straps. TWO: find images of famous masterpieces online that you like (Google is good for this!) I chose 2 paintings by Monet: "Woman with the Parasol" and "Water Lilies." Use paint, Photoshop, or a similar photo editing program to make your images 8.5 inches across by 11 inches wide (the size of a standard sheet of paper.) Make sure to mirror your image so when you transfer them to your canvas they won't be backwards (I forgot to do this with the "Woman with the Parasol" image above. Follow the instructions on your transfer paper to iron them onto your canvas, leaving 1/2 inch borders around the edges for seam allowance. ONE: first, fold your long leather strips in half wrong sides together (wst) and finger press down the middle. THREE: make sure you switch to a heavy duty needle for your leather straps, and sew down the bottom edge of your straps (wst), stopping 1 inch before the end. Repeat for second strap. FOUR: measure over approximately 1 inch down and 1 inch from the side of your purse and mark. Place the raw edge of your leather strap to the front of your bag according to your measurement, and stitch down to secure. FIVE: here is how your bag should look so far with your straps sewn to the front. SIX: repeat steps 4 and 5 to attach your second handle to the back panel of your bag. SEVEN: now to hem the top of your bag, fold down 1/4 inch, then fold down another 1/4 inch and pin. Do not iron! This will melt your image.) Using a regular needle and thread, sew across the top to hem. Repeat to hem the top of the back panel. EIGHT: switch back to your heavy duty needle and place your small leather scraps over the raw edge of each of your strap ends. Sew all the way around to secure. NINE: place the front and back panels of your purse right sides together and sew the sides and bottom. Clip corners and use pinking shears to cut excess fabric around the sides and bottom, then turn inside out. I hope your loved ones like their new bags too :) If you make one, I'd love to see a picture! Soooooo fabulous!! I love it! Now I need to hunt up some transfer paper! Very cute and lovely idea. 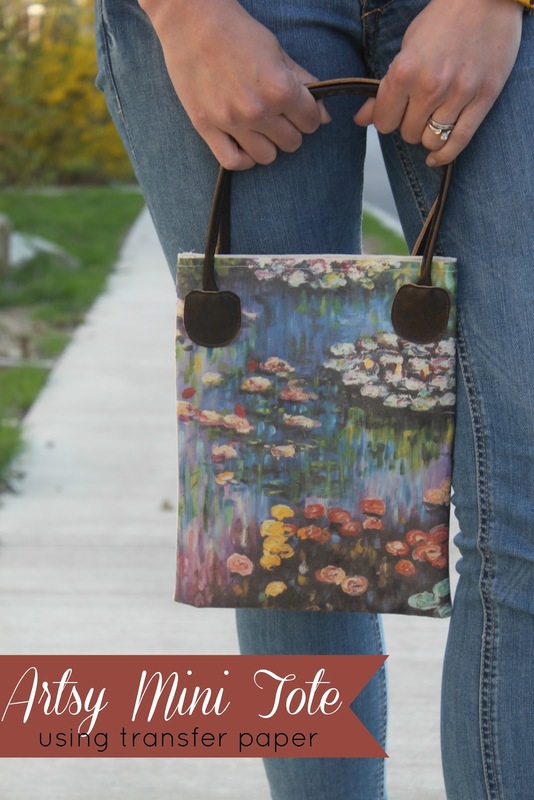 I love the Water Lilies too and am sure your MIL will love it too. Very nice bags! I would love to have one of these! Super cute! Love it! Thanks for sharing tutorial! These look awesome! I want to do this with my own paintings. I may even have some transfer paper somewhere..